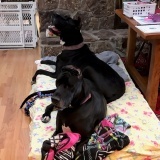 2019 Adoptions - Rocky Mountain Great Dane Rescue, Inc.
Charlotte and Eleanor have a home with their foster family in Parker, CO! 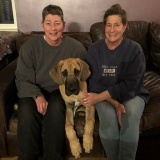 Randy & LeeAnn wanted to try fostering to get to know the Dane breed, and boy did they! They didn't hesitate when Charlotte and Eleanor needed a foster home together, and it wasn't long before they realized these two sisters were home to stay! They will be the only pets for Randy & LeeAnn, and will enjoy many walks, and outings. You may even see Charlotte and Eleanor at a few local events too! We are so happy for the girls and their new home! 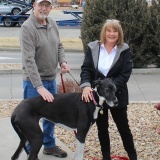 Balo has a home with his new family, Ray & Darlene, in Longmont, CO! Ray & Darlene are new to the state from Florida, and are excited to get out in the beautiful Colorado outdoors with Balo! 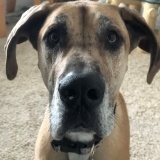 After losing their Dane last August, they felt that it was time to fill their home with another rescue, and Balo is the perfect fit for them! He will be the only dog, and will enjoy having company all day, as Ray & Darlene both work from home! So happy for sweet Balo and his new family! Brutus 2 has a home with his Foster Family in SLC Utah! 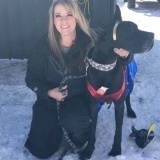 Shawn and Jessica were new to the Great Dane breed and wanted to get a feel for what it was like owning one, so they started with fostering. They didn't get far before failing miserably! lol Brutus 2 came into their home, and into their hearts! 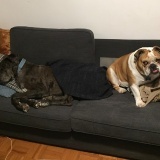 Brutus 2 will share his home with a 6 year old English Bulldog named Sherman, and Oscar, a 15 year old cat. We are over the moon happy for Brutus 2 and his new family! Way to go sweet boy! Mika has a home with her foster Mom in Denver CO! Jenny is a longtime Foster and Volunteer with RMGDRI. She fostered Mika, and knew immediately that she was the girl Jenny couldn't let go! 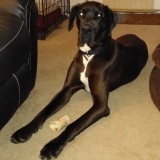 MIka will share her home with her three year old Dane brother, Jackson, whom Jenny adopted when he was a puppy. Mika will get to go on lots of walks with Jenny, and may even show up at some local events in CO, so keep an eye out for her! We are so excited for Mika and her new forever family! Motorhome has a home with her new family in Fort Collins, CO! 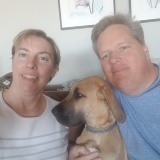 The timing was right for Michele and Bob to adopt a Dane, and they knew they wanted to rescue an older dog. Motorhome, may be 8 years old, but she does not act her age! She loves to run and play, and will have a giant new yard to do so in. She will love hanging out with Michele and Bob's grandson Evan, and will also share her home with Princess Laia, a three year old Calico cat. Motorhome will have company during the day, and will be getting all the ear and belly rubs she can stand! We are so happy for this senior girl, and her new family! Way to go sweet Motorhome! Rosco has a home with his new family in Sandy, UT! Andrea is the Foster Director, and has fostered many dogs over the years. Rosco was one she and Galen couldn't let go! 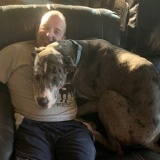 Rosco will share his home with an 8 year old Dane, Gunnar, whom they adopted from RMGDRI in 2012. Rosco enjoys snuggling with Gunnar, and loves to bring Andrea and Galen his toys when they come home from work. Rosco will get to go to work with Andrea at the doggie daycare where she works sometimes, and will enjoy going for walks around his neighborhood. We are so happy for this sweet boy and his new family! Ebony has a home with her foster Mom in Georgetown, CO! When Ebony came into Rescue, she was full of parasites and was a very nervous girl. She needed a special foster home where she could have her space, as well as someone willing to take her to her many vet visits and help her heal. With Katie having a background as a vet tech, she was the perfect person to foster Ebony. The two have since bonded, and Katie couldn't see her life without Ebony. Katie lives in the beautiful Rocky Mountains where she and Ebony can hike and explore whenever they want. Ebony shares her home with Joey, a 5 year old Terrier Mutt. She also guards over her chicken siblings, and loves to snuggle in bed with Katie! We are so happy for Ebony and her new family! Way to go sweet girl! Asa has a home with his new family in Salt Lake City, UT! Asa will be Kara & LIz's 3rd adoption with us! Beau, whom they adopted last year, crossed over the Rainbow Bridge in November and left Kara and Liz with a giant hole in their hearts. When they saw that Asa needed a foster home, they didn't hesitate. It was love at first sight! Asa shares his home with Thor, a 12 year old Rottweiler/Shepherd mix, Abilene, an 11-1/2 year old Pit Bull, two cats - Ryder and Pinky, two ducks - Francie and Billy, and a turtle named Ms. Reggie. Asa will not be short on companionship, or love in this family! Way to go sweet boy! Jax has a home with his new family in Franktown, CO! Jay and Kira have adopted from us before. They had three Danes at once until two of them passed from old age, leaving behind Angus, who is now 10. 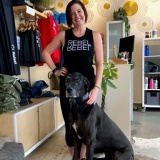 Jay & Kira love the breed so much, and were missing their boys, so they decided to foster and help another Dane in need. Jax came into their home, and has filled a big hole in their hearts. They knew he was home to stay! Jax and Angus have 2 acres to run and play on when they are not going for hikes, or snuggling with Mom and Dad! We are so happy for Jax and his new family! Way to go sweet boy! !